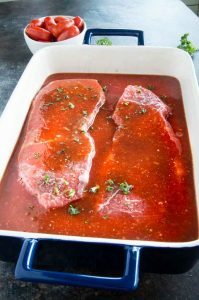 This easy homemade Bloody Mary gives the most delicious flavor for the most tender, juicy, flavorful flank steak marinade ever! Easy and fast enough for comfort food meals during the week and fancy enough for entertaining to rave reviews! Bloody Mary’s are one of my favorite cocktails! (Really, if you check out my InstaGram I often post that Im trying the newest creation at restaurants we go to!) On my site the number two cocktail is the Loaded Bloody Mary (loaded with a burger and a beef stick how can it NOT be amazing!!) When I saw at a local restaurant that they had a tequila sunrise Chicken immediately I thought what could I make with my favorite cocktail and suddenly the Bloody Mary Flank steak Marinade was a must make on my to do list! What goes into a Bloody Mary Marinade? 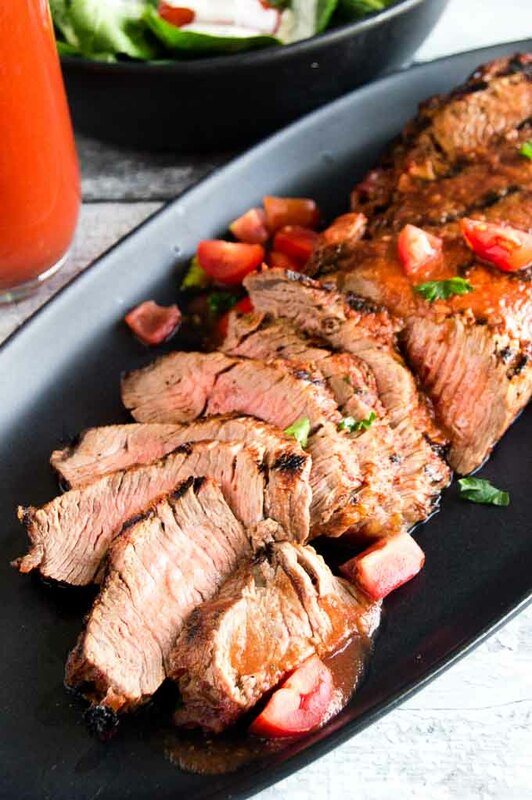 The first step in making a great flank steak is making a flavorful marinade. Bloody Mary’s have great ingredients. This marinade works to tenderize a tougher cut of meat. The acids from the tomatoes and the citrus from the lime really break down the fibers of the meat. Simply stirring the ingredients together and then pouring over the top of the flank steak is all that is required to start the Flank steak out on the right step! How long should you leave the Flank Steak in the marinade to maximize the flavor? At minimum leave it in the marinade for an hour, but you can also let it sit in the marinade for up to a day ahead. The longer you leave it, the more the flavor penetrates into the meat. How easy does this make it for easy comfort food for entertaining? Make it ahead and then just grill it when your guests are arriving and are ready to eat! How to guarantee a tender Flank Steak? The trick to a flank steak besides making sure you flavor it with a delicious marinade is how you cut it. Once its done grilling you need to look at the grain of the meat and cut across the grain. Its very easy to see in this photo that Ive cut across the grain. You’ll also notice that the grain in meat can change in the same steak. On the right where you see char marks, you can see where the grain is more at a diagonal. You’ll want to switch the way you are cutting to cut across the grain here. Why do you want to cut a flank steak across the grain? Cutting across the grain allows for maximum tenderness. The stretchier the meat could be, the more loose, (ie tender) it can be! Who doesn’t love a steak that almost melts in your mouth when you are eating it? What Side Dishes Work well with this Easy Grilled Flank Steak Recipe? Stir together all ingredients for the Bloody Mary marinade and then pour over the top of flank steaks. Flip over the flank steaks so all sides are covered in the marinade. Allow to sit in the marinade for a minimum of 1 hour, up to one day. Cover with plastic and let set in the fridge. Preheat gas grill to hot. While grill is heating up, remove steaks from marinade and set on a side plate. (Set marinade aside, you will use it later.) 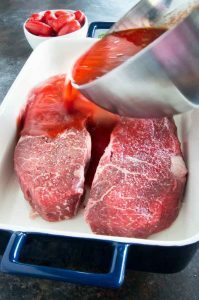 You do not need to rinse or wipe off the marinade before gilling. You will get great flavor and grill marks from the Bloody Mary Mixture when you place it on the grill. Grill the flank steak to your desired doneness. I purchased flank steaks that were 1 1/4 inch in thickness and grilled them for 8 minutes on one side, then flipped them and grilled them for 5 mins for Rare and the second one for 7 minutes for medium rare. ALL Grills vary in temperature so you will have to adjust the cooking times according to your grill. 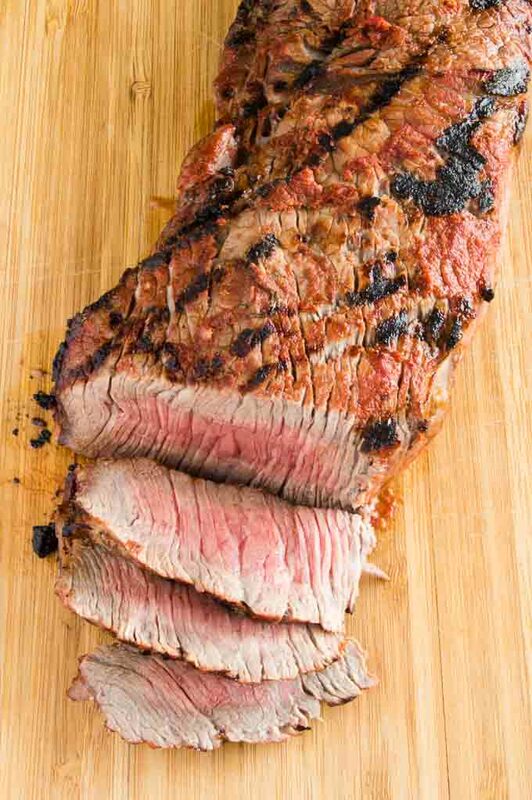 Once the flank steak is done grilling, remove the steak and set it on a cutting board to rest for 10 minutes to allow all the juices to settle. While the flank steak is resting, pour the marinade in a small pan and bring to a boil. Remove from heat and allow to cool. Once the steak has rested, cut across the grain and place on a plate. Sprinkle with fresh tomato mixture then spoon over a small portion of the cooked Bloody Mary mixture. Serve immediately. What a great marinade to make the meat tender. The name is very intriguing too, like Sunday brunch fun! 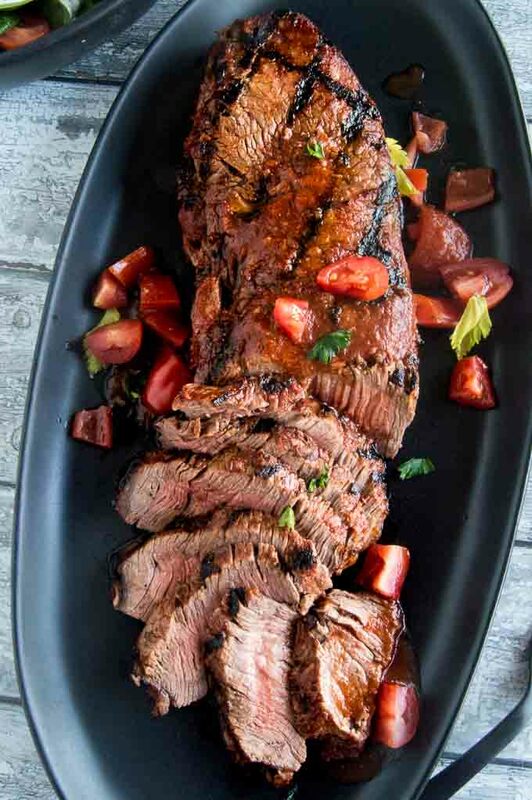 We love flank steak and summer is the best time for that! I’m saving this recipe and bet my family will love it! 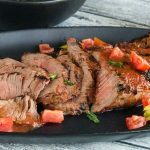 Bloody Mary Flank Steak – what a clever idea! Turning a favorite cocktail into a marinade is so creative I wish I thought of it! This has deliciousness written all over it! I can’t wait to try this recipe next week when I officially break-in the grill for the season! Yum for sure!